UFW Stories: "Farm Worker Stories Result in Book, Staffer's Changed Life"
"Farm Worker Stories Result in Book, Staffer's Changed Life"
When I worked for the UFW, I remember one morning, driving over to the East Los office thinking, “Wow, I am one of those lucky people who love going to work because I love what I do.” I felt incredibly fortunate and blessed, but my time with the union, always brought such sentiments. I helped write and produce the first book the UFW put out in nearly two decades. I interviewed countless farm workers and accompanied very talented photographers as part of my daily work. We traveled around the state. I remember being in Delano and being in a room for 10 hours and having countless workers and their families come in and share with me the reality they experienced in the fields… one by one. At the end of each night, I would reflect on their courage, their willingness to share their lives with me… a stranger, willing to listen, who was working to help stir change. The book “California’s Broken Promises” is beautiful. And it was my honor to even be a part of it. The stories there are published forever, but they are also kept inside my heart. I carry the workers, their voices, their hearts and hopes… with me daily. 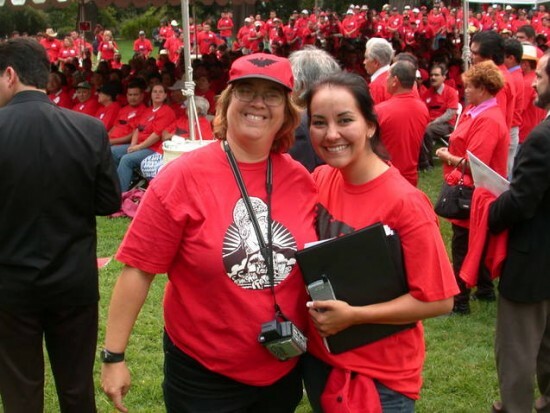 The time I had with the UFW truly changed my life. I knew I was a part of something bigger than myself and that the work I was doing mattered beyond any time required or any paycheck. It meant more, and unless you are there ... in the fields, marching or ... talking to the men, women and children, who work so tirelessly to put food on America’s tables, I do not think you can comprehend the power, the impact…and the beauty of the UFW.